The Miami Marlins underperformed in a major way in 2012. And after trading away nearly the entirety of their starting lineup last year, it became inevitable that sub-par attendance would mar the team once again in 2013. However, it is doubtful that anyone expected so few people to show up to Saturday’s Winter Warm-Up. Picture from Joe Capozzi. Ticket line 30 minutes before they went on sale. Taking the place of “Fan Fest,” the “Winter Warm Up,” promised the same hype, featuring player appearances, coach discussions, and the sale of single game tickets as Marlins prepared to host the fans at Marlins Park in Miami before shipping off to Jupiter for the next month and a half. However, the fan’s lack of enthusiasm, channeled from the above-mentioned circumstances of underperformance and a fire sale of players, was ever-present at Saturday’s event. Joe Capozzi tweeted a picture (right) around 9:30 a.m., showing the waiting line for single game tickets, which would go on sale at 10:00 a.m. A single game ticket sale at Yankee Stadium would draw a line that wrapped around the park, but yesterday in Miami, a meager four people were in line. A Fan Fest for any baseball team, no matter their success, generally garners quite a crowd in response to the family-friendly events they offer. But Marlins fans are not up in arms over their team’s poor performance, no, they are outright protesting the administration. For years now, especially since the 2006 fire sale and firing of Joe Girardi, informed Fish fans have been aware that the Marlins’ front office is not fit to build and maintain a baseball team. The fans love the players, but some of them can no longer handle the team. Also happening at the Winter Warm Up was a high school game between Archbishop McCarthy and Gulliver Prep. 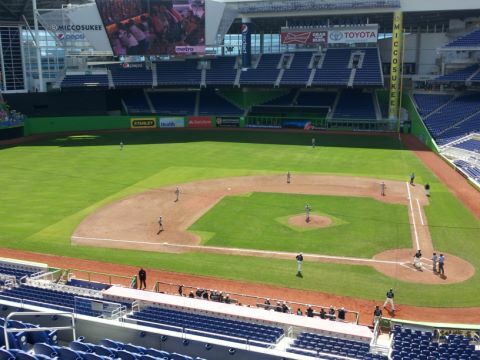 They played on the field at Marlins Park, which looks less-than-ready for the season. Panels of sod line the perimeter of the infield and surround the pitcher’s mound. Pitchers and catchers are reporting this week around the league as teams set up their spring training camps in Florida and Arizona. The Marlins open the regular season on April 1st in Washington D.C.. Their home opener is one week later against the Braves.